The War of 1812 with the British Empire commenced on June 18th. The War of 1812 with England officially ended on December 24, 1814 and unofficially in March 1815. General Andrew Jackson (1767-1845) and his small army defeated General Edward M. Packingham (1778-1815) and his large force at the Battle of New Orleans fought on the plains of Chalmette on January 8th. General Packingham was killed in the fight. Mississippi entered the Union on December 10th as the 20th State of the United States of America withDavid Holmes (1769-1832) As Governor. David Holmes had been Governor of the Mississippi Territory since 1809. On March 3, 1819, the Widow LaFontaine Claim [Section 37, T7S-R8W] was confirmed by an Act of Congress, entitled "An Act for adjusting the claims of land and establishing Land Offices in the District East of the Island of New Orleans". The land was surveyed in 1824, and a patent issued by the United States Government to the Widow LaFontaine on May 16, 1846. In 1835, Joseph H. Bellande (1813-1907) arrived in the United States, probably New Orleans, from Marseille, France. He was one of the first settlers in the fishing village of East Biloxi, which became Ocean Springs in 1854. Joseph marries Roseline LaFauce [LaForce], a granddaughter of Catherine LeBourgeios, the Widow LaFontaine, and inherits land from her estate in 1848. Joseph H. Bellande (1813-1907) married Rosaline LaFauce [LaForce] (1821-1895), daughter of Jacques LaFauce and Marie Eveline LaFontaine on May 26, 1842. She was the granddaughter of Louis LaFontaine and Catherine Bourgeois LaFontaine, the Widow LaFontaine. Circa 1840 before her demise, the 237 acres of land, Section 37, T7S-R8W, possessed by Catherine Bourgeois LaFontaine, the Widow LaFontaine, informally gave her land to her family. From west to east beginning at Martin Avenue and going to the Inner Harbor, the Widow LaFontaine original partition was to her sons-in-law, Jerome Ryan(1793- c. 1875), John Westbrook, and Jean Baptise Ladner; Joseph Bellande (1819-1907), the husband of her granddaughter, Roseline LaFauce (1821-1893); Azalie LaFauce Clay Ryan (b. 1820), her granddaughter; and her son,Louis Auguste LaFontaine II. The eastern three arpents were probably sold to Andre Fournier and his wife,Catherine Bouzage Fournie (b. 1780), many years before the Widow LaFontaine's donation to her family. The Fournier tract was bounded on the east by a small bayou called Bayou Bouzage probably for his wife's family. It later became known as Mill Dam Bayou, and after widening and dredging is now the Inner Harbor. In August 1846, a partition deed for the Widow LaFontaine Tract was filed at the Jackson County Courthouse. The land was divided by her heirs and legal representatives. From Martin Avenue east to the vicinity of the Gulf Oaks Condominiums, the land was parceled into five lots. Lot One ran from Martin Avenue 561 feet eastward, and was owned by Jerome Ryan (his wife, Euphrosine LaFontaine, appears to be deceased at this time). Lot Two ran from the east boundary of Lot One a distance of 672 feet east and was owned by Robert B. Kendall. Lot Three, also possessed by Kendall, was 720 feet wide. Lot Four which was 528 feet wide was owned by Joseph H. Bellande, his wife, Roseline LaFauce, and his sister-in-law, Azalie LaFauce. Azalie would marry George Clay (b. 1812), an Ohio millwright, circa 1849, and later Mr. Ryan. Lot Five was in the possession of Robert B. Kendall and ran 198 feet. Madame Fournier owned to Bayou Bouzage (Inner Harbor) which completed the seven arpents fronting on the Bay of Biloxi. The Louisville & Nashville Railroad was born March 5, 1850, when it was granted a charter by the Commonwealth of Kentucky “...to build a railroad between Louisville, Kentucky, and the Tennessee state line in the direction of Nashville." On December 4, 1851, an act of the Tennessee General Assembly authorized the company to extend its road from the Tennessee state line to Nashville. Laying of track began at Ninth Street and Broadway in Louisville in May of 1853. By 1855, the founding fathers of the L&N, most of them Louisville citizens, had raised nearly $3 million to finance the construction. The first train to operate over the railroad ran on August 25, 1855, when some 300 people traveled eight miles from Louisville at a speed of 15 mph! William Gray Kendall (1812-1872) was a Kentucky lawyer and entrepreneur residing at New Orleans, who in January 1846, purchased a fifty-acre tract of land at Ocean Springs in Section 30, T7S-R8W with 800 feet fronting on the Bay of Biloxi, between the present day Shearwater Pottery and Weeks Bayou. On this beautiful, high ground facing Deer Island to the south, he built a residence, icehouse, small cemetery. Mr. Kendall was postmaster at NOLA in 1854 and operated the Biloxi Steam Brick Works at present day D'Iberville. Kendall's brick making operation utilized over 160 slaves before it went bankrupt circa 1855. The Yellow Fever epidemic at New Orleans killed about 10,000 of the 30,000 persons infected with the mosquito borne virus. It earned the Crescent City the epithet "Necropolis of the South". Frederick G. Moeling (1835-1880), pronounced “mailing”, was the new Postmaster at “Ocean Springs”. His appointment date was December 12, 1854. 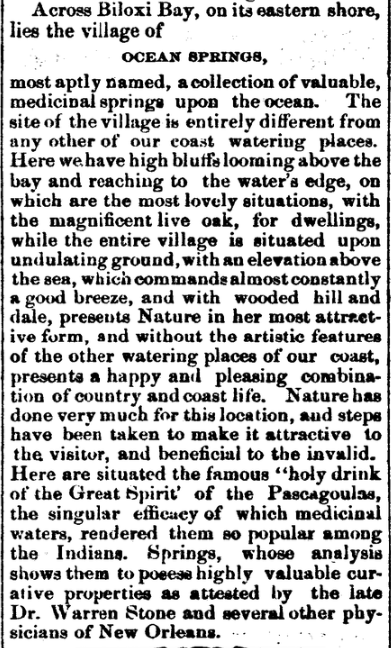 “Ocean Springs” took its name from the Ocean Springs Hotel, which had been erected in 1853 by Dr. William Glover Austin (1814-1894) and Warrick Martin (1810-1854+). The US Post Office here has been called Ocean Springs since this time. The Gazette, a newspaper owned by George Allen Cox (1811-1887), was published at Ocean Springs. Eye of Hurricane of September 15-16 passed over Bay St. Louis. The Last Islands [Isles Dernieres] Hurricane mauls this seaside resort off of Terrebonne Parish, Louisiana on August 11th and kills about 200 people. According to modern estimates by the NOAA the storm was probably aCategory 4 hurricane with central pressure of around 934 mb. It tied with Hurricane Hugo as the 10th most intense hurricane to hit the mainland United States. In 1859, Joseph H. Bellande (1813-1907) sold to Bishop William H. Elder of the Diocese of Natchez a lot measuring 192 x 100 feet for the first site of St. Alphonsus Catholic Church on Porter Avenue for $100. In the late summer and early fall, there were approximately one hundred seventy-five cases of yellow feverrecorded at Ocean Springs from the nearly six hundred people believed to have been here at the time. From this population about thirty deaths were recorded. Many were small children. The Van Cleave Hotel opened on May 1, 1880. The Pascagoula Democrat-Star of May 7, 1880 revealed: This entirely new and comfortable hotel opened on the 1st of May, 1880, and will remain open all the year round for the accommodation of regular and transient boarders. This hotel being entirely new and elegantly fitted up, and with large, well ventilated rooms lighted by gas, boarders will find every comfort desired. Special arrangements made for family. Rates moderate. The L&N Railroad leased the property of the N.O.M. & T. on May 8, 1880. US Federal Census burned. No population count for Ocean Springs. Town of Ocean Springs incorporated on September 9, 1892. H. Eugene Tiblier Jr. (1866-1936), found a sunken French vessel in the Back Bay of Biloxi beneath the shallow water over the family oyster lease, near the L&N Railroad bridge. Captain Tiblier hired Joseph "Pep" Suarez (1840-1912), who owned the schooner, Maggie, to assist in the salvage of artifacts from the hold of the sunken ship. His sons, Albert Tiblier and Vital Tiblier, dove on the oyster bank during the salvage operations. According to a report ofThe Pascagoula Democrat-Star of September 23, 1892, the Tiblier family recovered four cannons, swords and scabbards, some muskets, cannon balls, wooden sheaves, fire brick, iron braces, and rock ballast. The Ocean Springs Signal-published only in 1892 by C.W. Crozier and F.L. Drinkwater.(C.E. Schmidt, Ocean Springs French Beachhead, 1972, pp. 80-81). A fire in late September 1895 had destroyed the round-house which was adjacent to and north of the L&N depot. The depot was damaged by the blaze and water resulting from efforts to squelch the blaze. The station was entirely renovated in November 1895. Agent Weed, made numerous interior changes and the interior and exterior of the building was painted. Many felt that the Ocean Springs depot was the most attractive on this division of the L&N and a credit to the company. The Pascagoula Democrat-Star, October 4, 1895). Population of Jackson County 16513 people with 10697 white and 5815 black. Pioneer citizen, Joseph Catchot (1823-1900), a native of Mahon, Menorca, died. He was the father of Antonio J. Catchot (1864-1954), Mayor, Fire Chief, and L&N bridge builder. Joseph Catchot arrived here in 1848.